Plain washers to BS 4320: 1968 DIN 125, 433 and 9021. Also available special pressed and drawn components for Switchgears, Transformers, Elevators, Heaters and other electromechanical applications. 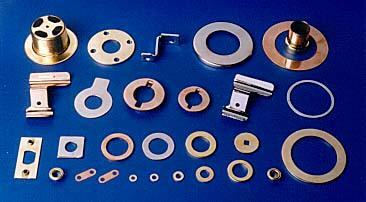 Material Brass, Copper, Stainless Steel (A2 / A4) and Vulcanized red fiber. Finish Natural, Nickel, Electro-Tin etc.